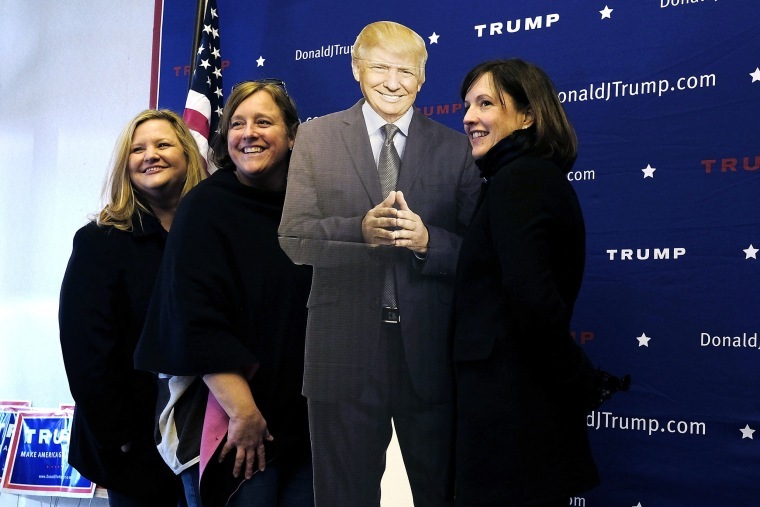 Data Download: Can Trump Win Over Female Voters? For Donald Trump there is some very basic, very real math between him and the White House. Women generally make up more than half of the U.S. presidential electorate and polls show they don’t really seem to like the Republican frontrunner. Negative views of Mr. Trump are hardly news. Overall 64% of Americans had a negative view of the GOP frontrunner in the most recent NBC News/Wall Street Journal poll, while only 25% had a positive view. But among women, those numbers go to 70% negative and 21% positive, as Carrie Dann noted last week. But dig a little deeper into the numbers and you get a sense of how big Mr. Trump’s problem is. For instance, the gender gap (the edge Democratic candidates tend to hold with female voters) is a well-known fact of modern politics. But it’s not uniform. White women often tend to lean Republican. In 2012 Mitt Romney won white women by 14 points according to exit polls – 56% to 42% for President Barack Obama. But in the latest NBC/WSJ poll white women go to Hillary Clinton in a hypothetical general election matchup with Mr. Trump by 10 points, 48% to 38%. If those numbers held they would equal an enormous 24-point swing in the white women vote between 2012 and 2016. That is a massive mountain to climb for the Trump campaign. Or consider Mr. Trump’s struggles with women in the places elections are won and lost, the suburbs. In the NBC/WSJ poll, Mrs. Clinton leads Mr. Trump among suburban women by 30 points, 60% to 30%. That split would seem to put crucial states on the electoral map in jeopardy for Mr. Trump. Think of the vast swaths of suburbia in Northern Virginia and around cities such as Philadelphia, Cleveland, Orlando, Denver and Raleigh, N.C. In fact, there isn’t a single women’s group Mr. Trump wins over Mrs. Clinton. She wins women who are college grads (60% to 30%). She wins women without a degree (56% to 32%). She wins women 18-49 (63% - 26%). And she wins women 50 or older (53% to 36%). Some of those wide gaps are certainly about the fact that Mrs. Clinton would be the first female presidential nominee of a major party, but not all of them. Texas Sen. Ted Cruz beats Mrs. Clinton among white women (48% to 43%). And Mrs. Clinton’s edge among suburban women drops to 15 points against Mr. Cruz. Of course, it’s not even April yet. There is a long way to go in the 2016 presidential race. But if Mr. Trump gets the nomination, the numbers here suggest he is going to have a lot of work to do if he wants to have a shot at winning in November. In 2012, women were 53% of the presidential electorate. Margins like these would make it all but impossible for a candidate who can't win women, to win a general election.